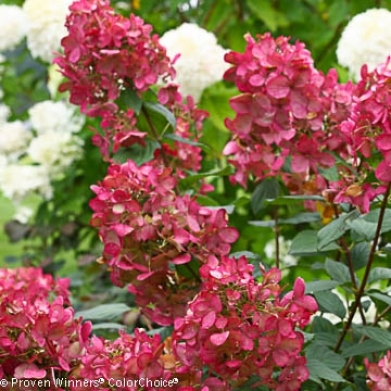 I have loved using the Proven Winners Shrubs in my designs for several years now. I love hydrangeas, and the more choices I have the better. Smooth Hydrangeas (arborescens), such as Annabelle and Incrediball, are great for their hardiness and long blooming time. 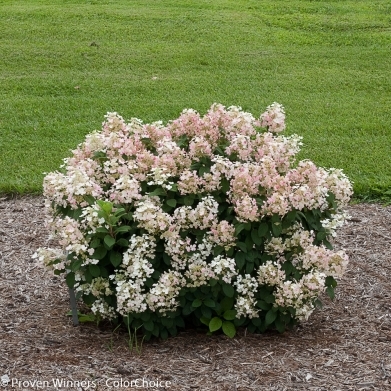 Bigleaf Hydrangeas (macrophylla), such as Endless Summer and the Let’s Dance series, offer a greater range of color but their flowers are more susceptible to winter damage since they flower on new wood. The Oakleaf Hydrangeas (quercifolia) have more of a natural/wild look to them. But, my favorite of all are the Hardy or Mophead Hydrangeas (paniculata). What can beat Limelight and Quickfire shrubs of beauty? The only problem……is that these plants are much to large for many landscapes. The answer……the team at Spring Meadows Nursery coming out with some GREAT varieties over the last few years. I had the chance several years ago to visit the owners home trial gardens with many of these plants were being tested before they hit the market. Here are the latest. They are hardy (to USDA Zone 3). They bloom every year – even after bad winters. The flowers open white and then turn pink-red. Little Quick Fire® is both compact and early to bloom, while Fire Light® is a larger plant that shines later in the season. That means that you should plant both of them! Why not make the hydrangea season as long as possible? It has the same early bloom time as the original Quick Fire, but this dwarf plant is about one third the size. The flowers quickly age to a deep burgundy red before other varieties even start to bloom. The compact habit makes it a great choice for smaller landscapes and container gardens.